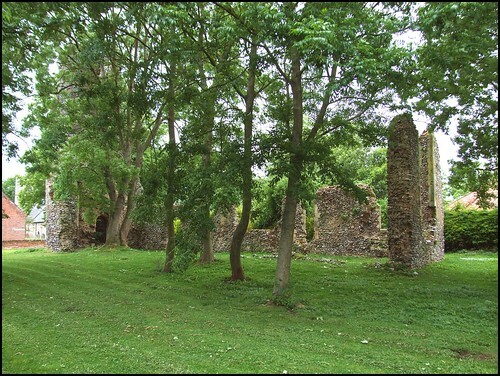 Kirby Bedon is a deceptively peaceful and remote parish which lies barely two miles from the edge of Norwich's urban sprawl, but protected from it by the flood plain of the River Yare, which meanders lazily Yarmouthwards across the top of the parish. Before the Reformation, there were two medieval churches here, just a few metres apart on either side of the village street, the square-towered St Andrew and this, the round-towered St Mary. This round tower is later than the church against which it was built. Almost certainly, the church here survived the Reformation, but fell increasingly into disuse, and was eventually abandoned as part of the consolidation of parishes which occured during and after the Commonwealth period. Certainly, it appears to have been disused by about 1700. Strangely, the shape of the graveyard appears to have survived intact, the boundary outline clear, a happy circumstance. What survives of the bulding is the gap-toothed tower, the north and east walls up to a certain level, and the outlines of doors and windows. The ruin is carefully maintained, and you can wander around it. The most curious thing is the view back to the tower from within the nave. The tower arch appears to have been filled in at some point, and a smaller doorway placed in it. Did this happen when the tower was built? Or at the Reformation, perhaps? Or after the building was abandoned, to enable the tower to still serve some purpose lost to us? Romantically, I hoped that the last possibility was the most likely, but the shape of the doorway suggests that it is the first which is correct.